I've narrowed down my tips to 3 key things I try to get people comfortable with first (bite sized bits to get them hooked). Most of the things that people are interested in are actions on a page. Did a visitor click on button X? Did they complete form Y? Watch video Z? These are all questions we can answer with event tracking. Because event tracking in Google Analytics is a blank slate in terms of setup and use, there is no one right answer for how to set it up and use. Given that most of my account was setup before I arrived in this position, I too have had to get used to a new architecture. The way I do this, and the way I explain it to my colleagues, is by investigating the event hierarchy. What are the categories, actions, and labels? How is data organized into these three tiers? Advanced segments are a great way to filter data to be more specific to the question you are trying to ask. For example, you can create a segment for a region (North America = US + Canada), or you can create a segment for a set of pages (meaning visit applies to homepage and/or about us page). To evangelize and teach this, I've created a Google doc that I've shared with my team with step by step instructions and links to some pre-built regional segments. 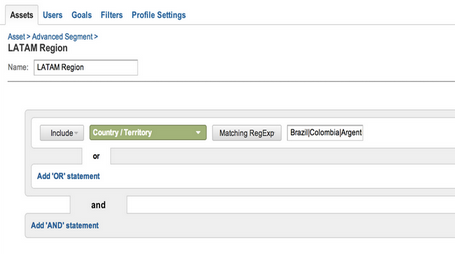 As an account admin, it's great to share out globally the segments you make that may apply to multiple consumers. And you can easily share links to segments for users to apply to their own account. Normally when an internal user asks for GA training and/or help pulling a report, it's for something they plan to look at on more than one occasion. Depending on how complex the report is, it may be useful to create a shortcut. Ex. Your account has 5000 uniques pages tracked in the pages report. You are interested in 4 pages that all share the same sub-domain (they may be steps in flow - example: www.myshoppingsite.com/women, www.myshoppingsite.com/accessories, www.myshoppingsite.com/handbags, www.myshoppingsite.com/gucci). You can filter the pages report (using advanced filters) to show only these 4 pages. Then you want to know how many visits to those pages had a checkout, so you apply a checkout segment onto the report. Then you also want to define that group one more step by only looking at North America traffic, so you apply a second advanced segment for North America. Then, just for kicks (or analysis) you want to know what the landing page was for this subset of purchasers, so you apply a secondary dimension for landing page. Now that's a fairly complicated report that took several steps to build. Your may not want to go through all those steps the next time you need this report (nor as an admin/power user do you want to have to show them again), so you can create a shortcut for this report. The shortcut link is a new beta feature located on the top nav bar that allows you to save a report as is and provides a shortcut link on the left hand nav to get back to it quickly. Pretty handy. As an admin or power user: Once your users have these three functions handled they will a) be able to pull a lot of their own data, freeing up your time, and b) feel more confident and excited about using Google Analytics to make data driven decisions. Win-win. Working as a practitioner in house at a technology company, one of my jobs is to teach my team members how to fish with Google Analytics. What should they be looking for in GA? Where do they start? What is meaningful? Are the campaigns being measured? Are the microsites tagged? These are the types of questions I get everyday, and very likely, you do too.